On July 5, 2014, Pretty Guardian Sailor Moon Crystal will premiere on Japanese streaming site Nico Nico Douga and on Hulu Plus 17 years, 4 months, and 27 days after the final episode of Sailor Moon: Sailor Stars aired in 1997. No disrespect to J.J. Abrams, but this is the most important resurrected franchise of the decade. Any questions? I am not a 12-year-old girl or a pervy thirtysomething dude. Why should I care about Sailor Moon? I am so glad you asked. Explaining to people why Sailor Moon is important is one of my favorite hobbies. It’s like watching soccer, in that there are countless attempts at victory and many failures, but when you manage to achieve your goal, it’s a truly rewarding moment. I. I Believe. I Believe I Can Convince You Of Sailor Moon’s Importance. Aside from being one of the most popular and well-known anime/manga series ever, Sailor Moon is a real-deal superhero franchise, arguably on the level of cultural significance of your X-Men or your Avengers. If you remember the English dub being a cult thing among kids here in the mid-’90s during the heyday of Cartoon Network’s Toonami block, multiply that fervor by 10 and that’s about how big Sailor Moon was in Japan. It’s widely credited with redefining the “magical girl” genre and proving that a female-dominant action show could be internationally successful. Yes, it was primarily targeted at children. But as with anything with this long of a run, it got pretty deep and weird over the years. People are still writing grad theses about it to this day. What does “magical girl” mean? “Magical girl” is a subgenre with a long tradition in anime and manga, usually aimed at young girls. Typical magical girl series feature a young female heroine who undergoes some kind of transformation and uses supernatural powers. Oddly enough, it was partially inspired by the huge popularity of Bewitched in Japan in the ’60s. Until Sailor Moon, magical girl series usually saw their heroines using their powers to have fun or win boyfriends or have cute adventures. There’s still plenty of romance in Sailor Moon, but the master arc is always about our heroines saving the world, which was not the norm at the time. I think I clicked on this by accident. What is Sailor Moon, even? Give me the elevator pitch. Sailor Moon is about Usagi Tsukino, a whiny, kind of dumb but kindhearted 14-year-old girl who meets a talking cat named Luna who tells her that her true identity is Sailor Moon, a warrior who has been sent to Earth to defend it against evil. (That first episode, where Usagi meets Luna for the first time, is iconic in Japanese pop culture, as imitated and parodied as, say, Peter Parker getting bitten by a spider.) Along the way she’s joined by four other guardians: Sailors Mercury, Mars, Jupiter, and Venus (and in later seasons, Pluto, Neptune, Uranus, and Saturn). She falls in love with Mamoru Chiba, a.k.a. Tuxedo Mask, a guy in a top hat and cape who throws roses at monsters. In the first season, which is what I assume is being readapted in Sailor Moon Crystal, their mission is to find something called the Legendary Silver Crystal and to find the Moon Princess, whom the sailor guardians have been sworn to protect. I know! And it kind of is! It’s also the best! It seems like there are … a lot of characters. Who’s the best? I’m partial to Saturn, Uranus, Neptune, and Venus, because there’s something heartbreaking about a girl who really wants to be a pop idol even though she’s already a famous superheroine who can shoot energy beams at people. Sailor Mercury, a.k.a. Ami Mizuno, the shy nerd, is far and away the most popular in Japan. That’s Chibi-usa, a.k.a. Sailor Chibi Moon (in the dub — sigh — “Sailor Mini Moon”). She’s Usagi and Mamoru’s daughter from the future, who was sent by her mom (that’d be future Usagi, Neo Queen Serenity) to be trained as a warrior by her younger self. I’ll wait while you reread that sentence three times. A lot of fans don’t like Chibi-Usa, who’s sort of the Scrappy-Doo of the show. I find her to be the least interesting of the 10 senshi, but she makes up for it with her stupid-funny first attack (which may or may not be my ringtone right now). Please sum up the various iterations of Sailor Moon. The anime and manga both debuted in 1992, with the manga having a few-month lead on what was essentially a filler-fied anime adaptation. Together those entities basically comprise canon for the franchise. The anime spanned five seasons and 200 episodes, while the manga ran for 18 volumes (12 in the current edition, compiled slightly differently). DiC and Cloverway dubbed and distributed four of the five seasons for American television, but these translations are widely considered to be hatchet jobs by serious moonies (yes, that is what fans are called; no connection to the Unification Church as far as I know), for reasons I’ll get into later. The final season, Sailor Stars, was skipped entirely, also for reasons I’ll get into later. Problematic as the dub may have been, it did serve as a gateway drug for many American fans, many of whom later sought ought the hard stuff, via fan-made subtitled bootlegs and, later, the official uncut releases by ADV and Pioneer. Then you’ve got your ephemera: the tokusatsu (live-action) series Pretty Guardian Sailor Moon, various video games, stage musicals, etc. Nobody really cares about these. And I say this as someone who sank a lot of time into an emulator translation of Sailor Moon: Another Story. Naoko Takeuchi, a.k.a. Princess Naoko, a former chem student and pharmacist, who wrote her first comic at age 19. She wrote and illustrated the entire Sailor Moon manga series. The anime adaptation was produced by Toei Animation. Why are their eyes so big? I mean, have you seen anime? In general, bigger eyes are visual code for a more sensitive/emotional character. Hence the younger inner-planet senshi have bigger, more reflective eyes than the older, more stoic outer-planet senshi. Why are they wearing sailor uniforms? The now-iconic, oft-parodied sailor fuku is a riff on the typical uniform worn by junior high and high school girls in Japan. Takeuchi has said the idea came to her as a way to make a powerful superheroine that was relatable to a typical young girl. She is also very, somewhat mercenarily aware of how that image has been co-opted sexually by the non-junior-high girl audience. She seems OK with it. And that’s what’s both frustrating and interesting about Takeuchi-san — she can be radically progressive when it comes to gender roles and feminism, but also is a girly-girl who talked in her footnotes in the Mixx manga translations about how she just wanted to write a story about cute girls and handsome boys. The anime and manga are not without their gratuitously pervy moments. I’m sure there are corners of the Internet dedicated to frame-by-frame analysis of the silhouetted transformation sequences. On the flip side, much has been written about typically feminine objects — compacts, mirrors, schoolgirl uniforms — recoded as weapons in the Sailor Moon universe. Sailor Moon can be read as third-wave feminism taken to the max, reveling in its girliness and positioning traditionally “female” traits (emotions, sensitivity, cuteness) as the only forces that can save the world. Wait, back up … are you calling Sailor Moon feminist? Yes, duh. If you’re looking for an antidote to the boy party that is the majority of Stateside superhero franchises, Sailor Moon is a veritable universe of women. Its heroines are women, but so are most of its villains. Just like Orange Is the New Black! Many of its central battles are between queens. 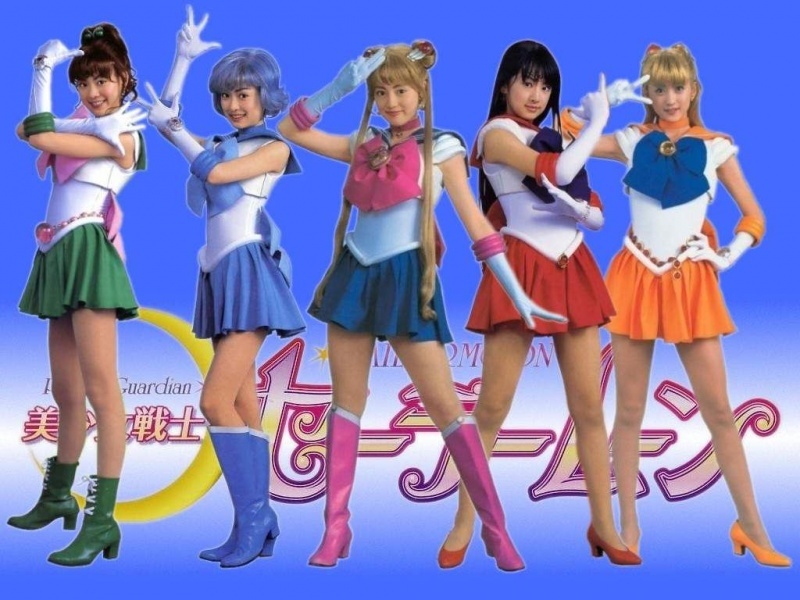 Takeuchi has been adamant that only women may be sailor soldiers, which is why she was less than happy with the tweak made on the Sailor Starlights in the anime. It’s feminist in the way that Xena: Warrior Princess was feminist. Also, hilariously, the premiere in Japan was not open to men unless they were there as a guest of a woman. That’s staying on message. But doesn’t Sailor Moon always get saved by Tuxedo Mask? Nope. In the anime, Tuxedo Mask is comparatively weak next to the sailor soldiers. His role in battle is to create a momentary distraction so that Sailor Moon may deliver the kill shot. Alternately, he will deliver an inspirational pep talk to inspire Sailor Moon to persevere and defeat the enemy. So yeah, he’s a movie girlfriend. Aren’t there like, lesbian sailor scouts? That sounds dope. Let’s not call them “scouts” — that’s a remnant of the original DiC dub translation and doesn’t really accurately translate from the original “senshi,” which has been more faithfully interpreted as “soldiers,” “warriors,” or “guardians” in the manga and the upcoming reboot. And yes, two of the senshi are in a relationship: Sailor Uranus (Haruka Tenoh) and Sailor Neptune (Michiru Kaioh). And not in a side-plot are-they-or-aren’t-they way: Haruka and Michiru are badass to-the-death OTPs across space and time. They are also very cool in their human form (awesome cars, fancy hobbies, etc.) and have a way more, ahem, “adult” romance than the central couple, Usagi and Mamoru. If you find yourself rolling your eyes at the schmaltziness of the Sailor Moon/Tuxedo Mask backstory (which is, I will say, much better done in the manga), Haruka and Michiru are the ’ship for you. I love them. I love them so much. So it’s progressive in a kind of bananas way and is culturally significant as a genre piece. But is it fun? But it’s fun the way any genre show is, too. If you’re prone to this kind of thing, you’ll immediately get caught up in the mechanics, identifying your favorite attack sequences and villains, figuring out which characters are the most like you and your friends. You know, superhero stuff. And then along the way you’ll get emotionally invested and once you hit that five-to-10-episode streak leading up to a season finale, it’s all over. Do not be surprised if this often shoddily animated, formulaic Japanese children’s show makes you cry. You are not alone. Anyway, crying is fun, right? What else is fun? The translated episode titles are all great (“The Snow! The Mountains! Our Friendship! And of Course, a Monster, Too”). Sometimes Usagi gets drunk. Takeuchi was also a big fashion-head, and the manga and anime are both filled with some truly inspiring ensembles. OK, I’m watching the first episode, and … wow. Usagi is the worst. Yeah, that’s fair. Also, Frank Underwood killed a dog in the pilot. Seriously, though, Usagi’s superficial uselessness does position her as a kind of antihero to potentially be redeemed. Frequently she’s pure id, eating too much cake, lusting after boys, throwing a fit whenever things don’t go her way. But over and over again, it’s her essentially good heart and her trust in others that wins her battles. By the final season she’s noticeably more mature and emotionally developed (but not in the fourth. She’s a mess in the fourth). And besides, that’s kind of what the rest of the senshi are for, all of whom are incredibly distinct and well developed as characters for, you know, a “kids’ show.” Mars and Mercury especially tend to serve as voices of reason, but they all have their strengths and weaknesses. Do I need to watch the original series to enjoy Sailor Moon Crystal? Where and when can I watch Sailor Moon Crystal? On Hulu Plus or Crunchyroll with a paid subscription. Whatever your preference/lifestyle. The first episode is scheduled to be up at 6 a.m. ET on Saturday, July 5. New episodes will premiere every two weeks for the next year (26 episodes total). Great. I’m still not going to watch Sailor Moon, but this has been moderately interesting. Learning about other cultures is important. Thanks for joining me this far!